Build it and they will drive. That seemed to be the inspiration behind the birth of the Pennsylvania Turnpike Commission’s Mon/Fayette Expressway Projects. Originally planned as a vital connector of steel towns along the Monongahela River Valley, the new highway system now holds the promise of economic development and a link to nearby Pittsburgh. Approximately 35 miles of the Mon/Fayette Expressway system are operational. 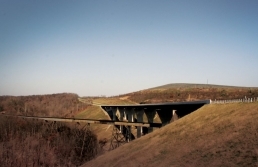 The newest project, 17 miles north of I-70 to Route 51 in southeastern Allegheny County, opened on April 12, 2002. “These awards show that the Turnpike Commission is receiving state-of-the-art design and construction services from its consultants and contractors, not to mention our own staff professionals who contribute to and monitor this work,” said Frank J. Kempf Jr., Assistant Chief Engineer for Development Projects/Programs.